This tour has 7 nodes/spots. To view each of the spot, please hover the mouse over the thumbnails and click on it in the bottom middle of the tour window. If you wish to view this sopt on the tour map, click on the Map button on the left bottom corner. Belum Caves, the second largest stalgamite and stalacite rock formations in the Indian Sub-continent is located in the Andhra Pradesh state of India. This picture is the entrance to the rock cave that is 3.5 kms in length. Public is allowed only upto a length of 2 kms into the caves. Although discovered in the year 1884, Belum Caves gained much popularity in the past 3 decades and has been officially declared as a protected tourist attraction in the year 2002. This place is the Gebauer Hall, a point for the visitors to seat for a while and admire the place. It has been named after the famous German explorer, H Daniel Gebauer, who, in the year 1982-84 explored the Belum caves to its fullest length. The Belum Caves are highly regarded in by historians because of being home to Buddhist monks. These caves have been house to many Pre-Buddhist era relics. There are 16 different pathways, including the main entrance and there are deposits of Quartz in the caves. The caves are formed in Black Limestone. The beautiful naturally formed rock caves that has thousands of years of history reverberating around has been maintained and being beautified by the APTDC since the year 1999. Belum Caves have long passages, spacious chambers, fresh water galleries and siphons. It is a natural underground cave formed by the constant flow of underground water. The caves reach its deepest point (150 feet from entrance level) at the point known as Pataalaganga. Belum Caves derive their name from “Bilum” Sanskrit word for caves. The Belum rock caves at Belum Village in Kolimigundla Mandal of Kurnool District in State of Andhra Pradesh, India are part of a larger complex of caves carved out of the limestone deposits in the Erramalai region. The whole of the place inside the cave part is well curated and maintained by the state transport board. The Belum caves, known for their stalactite and stalagmite formations have long passages, spacious chambers, fresh water galleries and siphons. It is a natural underground cave formed by the constant flow of underground water. Due to the constant flow of water underground, the rocks are patternized and look like a design wanting to be appreciated by the human eye. Free roaming around in the cave is highly unadvised since the place is melancholic. Always take a guide or go in groups. In fact, such a tour of the cave could only be well enjoyed rather than just going in single. The APTDC (Andhra Pradesh Travel & Development Corporation) has been awarded for promoting and maintaining this naturally formed adventure destination. There might be mixed opinions on different minds when going through the caves. While some think that it all seems post apocalyptic remnants, some others think the beauty surrounding an underground river that existed once. It is all in perception. Belum Caves is more embedded in history of time since explorers and scientists have dated back its existance to over 6500 years. Archaeological survey of India (ASI) found remnants of vessels, etc. of pre-Buddhist era and has dated the remnants of vessels found in the caves to 4500 BC. There are different section inside the Belum Caves. They include the Pillidwaram, Kotilingalu Chamber, Patalaganga, Saptaswarala Guha or the Musical Chamber, Dhyan Mandir or Meditation Hall, Thousand Hoods, Banyan Tree Hall and Mandapam. Each place bears some significance and carries a separate history with them. 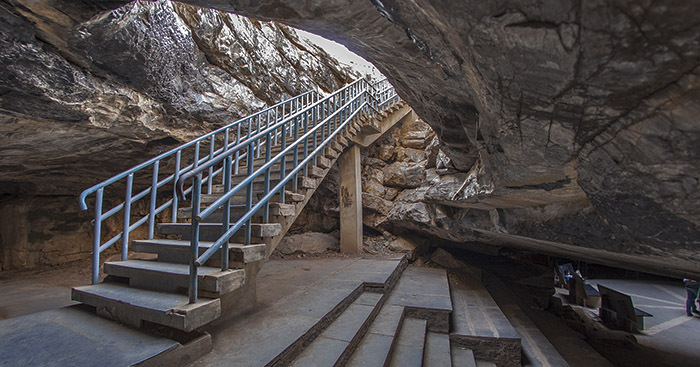 Andhra Pradesh Tourism Development Corporation (APTDC) has developed the pathways in around 2 km of the length of the caves, provided soft illumination and has created fresh-air-shafts in the caves. 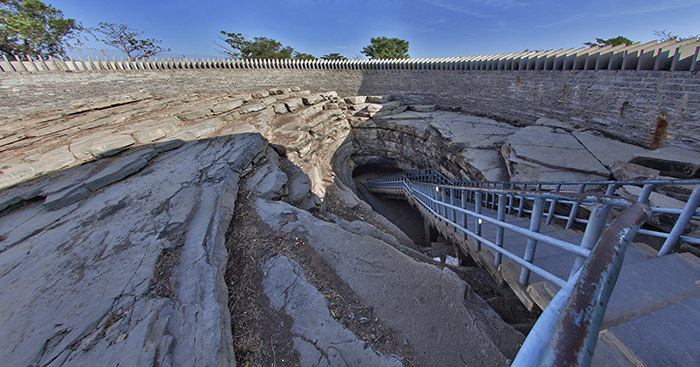 At many places inside the cave, APTDC has installed bridges, staircase, etc. for easy movement inside tha cave. It has also created a canteen, washroom and toilet facilities near the entry point. There is a giant Buddha Statue near a hillock near the Belum Caves. The area of cave known as “Meditation hall” was used by Buddhist Monks. The relics of Buddhist period were found here. These relics are now housed in museum at Ananthapur.